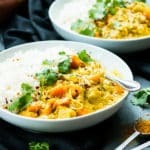 Slow Cooker Chicken Curry that is made with coconut milk and easy to find ingredients!! It is naturally gluten free makes a delicious lunch or dinner when served with rice. In a small bowl combine curry powder, turmeric, coriander, salt and sugar. Toss to combine. Place chicken breasts in a 4-6 quart slow cooker. Add coconut milk (and water if milk is thick). Make sure to lift up the chicken breasts to prevent the chicken from burning. Add butter, garlic, and the bowl of seasoning ingredients. Stir the liquid to incorporate the seasonings. Add sweet potatoes and onions. Stir to combine. Cover slow cooker and set to Low for 6-8 hours, or High for 4-6 hours. Check on curry during the last hour of cooking and stir the ingredients if the curry is starting to stick to the sides. During the last 30 minutes of cooking, remove chicken from the slow cooker and shred it with a fork. Place chicken back into the slow cooker for the remaining time. Turn off slow cooker and let rest for at least 20 minutes before serving. This will help thicken up the sauce. Serve chicken curry with jasmine rice and additional cilantro, if desired, and enjoy! See this recipe in Meal Plan #6. *Nutritional info is calculated with "lite" coconut milk and no rice.